John Lukic the Leeds United goalkeeper keeps an eye on the action here as Leeds United take on Oldham Athletic in the First Division clash played on October 26th in the 1991-92 season. United won the league that year, the last First Division title before the Premier League started. 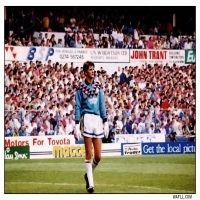 John Lukic signed for Leeds United as a schoolboy and made his full debut in 1979. After United were relegated in 1981-82 Lukic stayed with Leeds for a another season but lost his place as he wanted to leave the club to play at the top level. Lukic was eventually signed by Arsenal on 1st July, 1983 for £50,000. By this time Lukic had made 165 appearances for the Whites. Wilkinson brought Lukic back to Elland Road on 1st June, 1990 to replace veteran Mervyn Day for a fee of £1M. Lukic made another 265 appearances for United winning the First Division Championship along the way in 1991-92. Lukic overhall made 430 appearances for Leeds United. Leeds won the game featured with Oldham Athletic 1-0. An own goal gave United the points in front of 28,199 fans. Leeds United: Lukic, Sterland, Dorigo, Batty, Fairclough, Whyte, Strachan, Rod Wallace, Chapman, McAllister, Speed. Subs: Kamara for Speed, Shutt for Strachan.